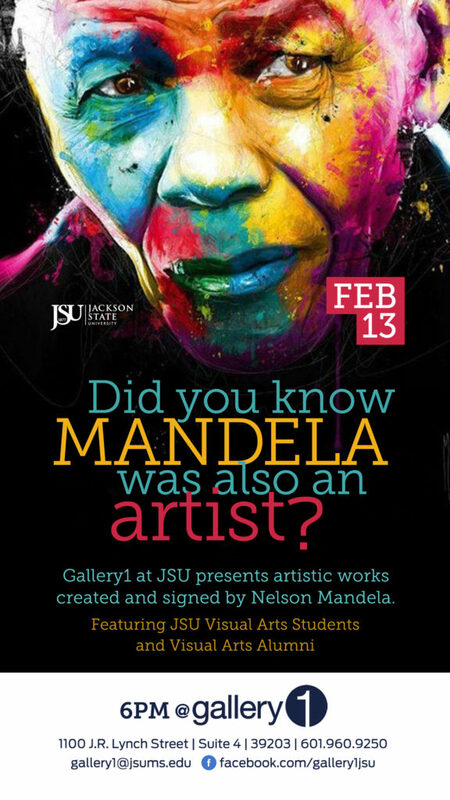 Jackson State University’s Gallery1 will present artistic works created and signed by renowned human rights activist, Nelson Mandela. Opening Feb. 13, the exhibition will run through March 31. Additionally, an exhibition of photographs titled “Nelson Mandela: His Life in the Struggle” will be on display at COFO. Gallery Director, Shon McCarthy received the works from Laura Walford of Belgravia Gallery in London. She also had to write a proposal to his eldest daughter Dr. Maki Mandela to receive approval in order to have the works shared with JSU’s Gallery1. There is also a separate collection that was not signed by Mandela. This is a series of collaged newspaper articles that includes photography which chronicles the life and times of Nelson Mandela. It was purchased from the Robben Island Museum in Cape Town, South Africa, by Dr. Rico Chapman, director of the Fannie Lou Hamer Institute and associate professor of history at JSU. The former president of South Africa, Mandela helped bring an end to apartheid. He was a member of the African National Congress Party and was also a leader in peaceful protests and armed resistance against the white minorities that racially divided South Africa. His actions as an activist landed him in jail for 27 years. This made Mandela the face of the antiapartheid movement within his country and internationally. Upon his release from jail in 1990, Mandela participated in the eradication of the apartheid and became the first black president of South Africa. “I could not get enough of this looking at, feeling, touching and experiencing this new recovery of the experience of color. When I initially did the sketches in black chalk, the images looked quite bleak,” Mandela said of his drawings of Robben Island, “I then thought it should be a celebration and introduced the bright cheery colors,” Mandela said in an interview with The New York Times. Belgravia Art Gallery Directors Anna Hunter and Laura Walford visited Mandela at his home in 2002. During the visit, Mandela explained to them his love for drawing and how he had a vision to use his art to help underprivileged children affected by HIV and poverty. By selling his art, Mandela could give back to these communities and make a difference in the lives of young children. Chapman was an exchange student at the University of Fort Hare in South Africa, where Mandela was also a student in 1939. Chapman hopes JSU students are fascinated by the works presented and the commonalities between the struggle for civil rights in America and against apartheid in South Africa. This grand opening event will feature JSU Visual Arts students and alumni. Students from the School of Journalism and Media Studies assisted with the promotional video for the Mandela exhibition. The limited edition and signed art collection by Mandela are on display at Gallery1 and was made possible by a grant from Title III.